Selma created this beautiful card using the new Susan Cockburn Mini Daisy dies. You can creat all about it by clicking here! A big thanks to all of you who participated in last week's challenge. I loved your creativity on using the world Tulips. Fun!!! I will be sending Rebecca a Poppy Stamp Die. 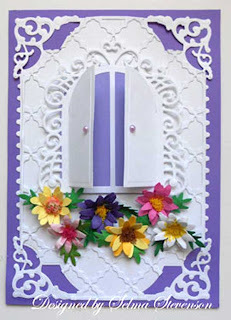 You can see Rebecca's beautiful card by clicking here! If you haven't left her a comment, please do.